I’ve already made my feelings clear about what I feel is the over-commercialisation and money-grabbing attitude of the London 2012™ Olympics in a previous post. From the ridiculous complicated ticketing process, to the draconian legislation relating to the use of certain key words and phrases for marketing purposes, including the removal of company logos from toilets! It just didn’t seem like the true Olympic spirit. It’s not that I wasn’t looking forward to the sporting spectacle. There’s nothing I appreciate more than the sight of intensely toned athletes, exerting every last ounce of energy, sweating in the summer sun… But more about the women’s beach volleyball later. It’s fair to say that my negative view of the organisation may have had something to do with losing out on my desired tickets, although I did manage to get tickets to a couple of football matches as they were easy to acquire due to the high-capacity venues. But as the weeks have passed and the media coverage intensified, I couldn’t help but feel swept up in the excitement. Hell, our post-‘drought’ monsoon conditions even relented to allow some unbroken sunshine as the athletes arrived. It was as if God was an Olympics fan. And then, as if touched by more divine inspiration, the London 2012™ organisers managed to locate more tickets to put on sale, mere weeks before it all kicked off. Enthused by the second chance thirtieth chance to buy tickets, I purchased tickets for beach volleyball and indoor, non-sandy volleyball (or whatever it’s called). Not just the women’s matches though, they paired them with men’s games, the crafty bastards. I also vowed to watch as much of the free events as possible, even if it meant witnessing masochists attempting to dislocate their hips in the race walk. It’s true that no-one can even pretend to care about the result of the race walk, but it’s there and I can watch it holding a beer, so why not? But then it got even better… Big Boy, my partner in travel adventures, texted me to say that he had a spare ticket for the athletics in the Olympic stadium! I was so touched that he had come to me first… after the first seven people he offered it to couldn’t make it. Naturally, I snapped it up instantly. Finally, to cap it all, the Olympic torch relay made its way conveniently past my office yesterday, just after I finished work. 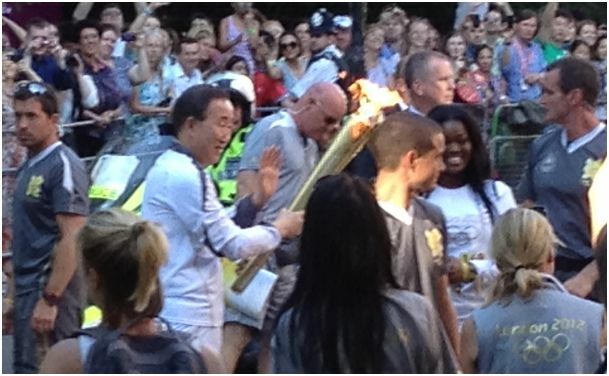 An older oriental gentleman was carrying the torch. He looked familiar, so I was wondering if he was maybe a local hero who works in Chinatown and does some work for charity. Maybe he had even served me in a restaurant once before? How lovely to give the role to the ‘common man’. And the media were scrambling to talk to him afterwards, so it gave him his 15 minutes of fame. SO SORRY about your tickets! Are you being sarcastic? I’m not complaining now. Just think they could have managed the ticketing better. Look at the spaces at the swimming! No, I wasn’t. I know when the Olympics were here, I thought it would be bad to miss out on tickets I wanted a d get tickets to stuff I didn’t want! I was sympathizing! Sorry if it sounded differently! But I got a ticket for the athletics, so I am happy! I take it you are sympathising with the torment of applying for tickets. It’s been a bit of a joke! I didn’t even bother to try for the tickets. I have nothing against the Olympics itself. It’s not the athletes fault that it’s becoming a money grabbing elitist behemoth that excludes most of the Londoners who will be paying for it in perpetuity. And look at the empty seats that have been shown at most of the venues so far. How many more people could have watched the sporting event of their choice if it was a more open system? Thankfully, seeing the torch relay in my area made me finally feel a (small) part of this event and I thought the opening ceremony was brilliant, if a little patchy in parts. Lucky, lucky you to be getting so many tickets to the sports you wanted to see and to see the head honcho of the UN running with the torch. Enjoy the games. I expect to see a report about it on my desk in the morning. I’ve been pleased with what I have seen on the first weekend, apart from missing the start of the beach volleyball through bumbling officialdom. You can always go to some of the free events. Ah, I did love this. Your honest post reflected far too much my own opinions to the point that I started sweating slightly, wondering if I was actually some sort of Stewie split-personality (alliteration, yay! ).